What does one do when one receives an entire case of beautiful, sunny Limoneira lemons? 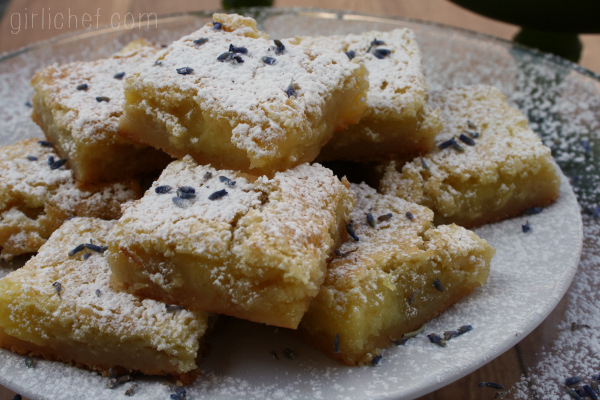 One makes lemon bars, of course! Now, I don't live in a climate that allows for an abundance of citrus trees. I'm sure there are a few scattered about, being nurtured inside of a warm porch or a green house. But that is neither here nor there. So, when I had the opportunity to dive into three varieties of lemons that were shipped right to my front door, I got down to business. 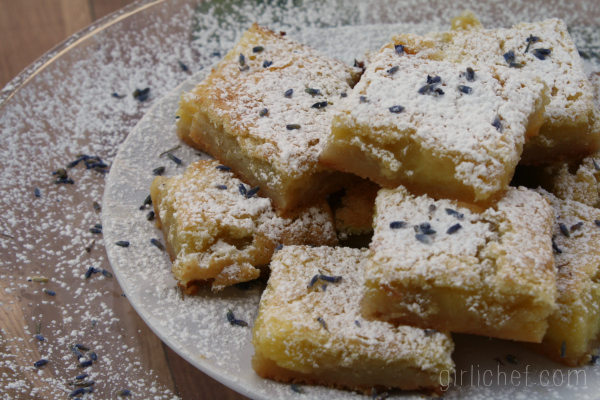 These gorgeous lemon bars, tinged with the scent of lavender buds, disappeared in short order (plus, I shared some with the neighbors). 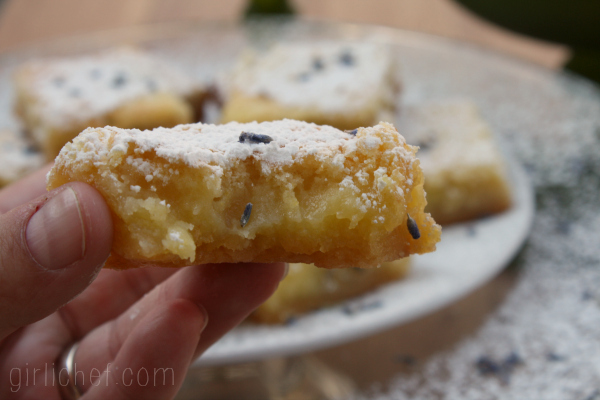 And while I have a favorite lemon bars recipe, this version nips forcefully at its heels in competition! I used the seedless variety of lemon to make these...they were fat and juicy with smooth skin and bright flavor. I also received some cool pink lemons - pink on the inside, with green zebra stripes over the yellow skin...and some nice-sized "regular" Limoneira lemons. Let's just say that we've had lots and lots of lemon love around here lately. From lemon-herb roasted potatoes to lemon jam to a couple of huge pitchers of lemonade, not a single piece of fruit went to waste. Preheat the oven to 350° F. Butter a 9"x13" baking dish, and line the bottom with parchment paper. Cut the parchment so that it's a bit longer than the pan, so that you can use it as handles to lift the bars out. Butter the parchment, as well; set aside. Beat the butter and sugars together until light and fluffy, 3-5 minutes. Scrape down the sides of the bowl, and add the flour, sea salt, and lavender. Beat on low until the dough comes together in crumbles. Dump the mixture into the prepared baking dish, using your hands to press into an even layer in the bottom of the pan. Slide into preheated oven and bake until slightly golden, 20-25 minutes. While the crust is baking, whisk the eggs and sugar together in a medium bowl until it looks light. Whisk in the flour, lemon juice, and lemon zest until blended completely. When you pull the crust from the oven, immediately pour the filling over it. Return to the oven and bake for another 20-25 minutes, or until the filling no longer wiggles in the center, and the edges are lightly browned. Set the pan on a wire rack and cool completely. If you used parchment, lift the whole thing from the pan and set on a cutting board. Cut into 24 bars (6x4). 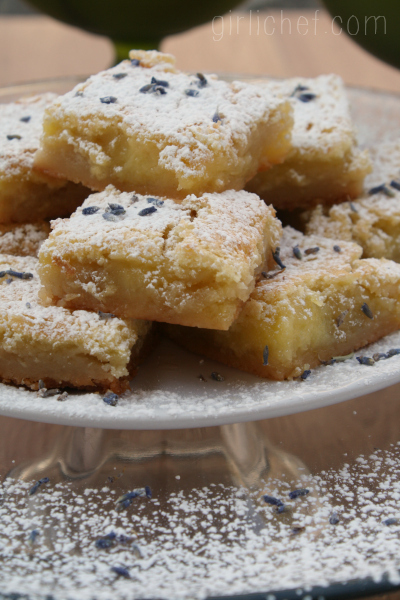 Sift some powdered sugar over the top, and scatter with some lavender. If they won't all be eaten that day, place them in an airtight container, separating the layers with wax paper, in the fridge for up to 4 days. I received a free case of lemons from Limoneira to do with as I pleased. I was not compensated for this post, and all opinions states are my own.